LWRC's REPR or Rapid Engagement Precision Rifle was born of requests from troops for an accurate, more powerful semiauto. The LWRC International REPR (Rapid Engagement Precision Rifle) comes to us from requests by our war fighters. Specifically, when our armed forces members are whacking IED insertion teams, they need more shots, faster than what a bolt-action rifle can deliver. And in the wide open of Afghanistan, you also need reach. So the push is on for a semi-auto .308 rifle with durability and accuracy. That the services can't stop tripping over their own feet in selecting one doesn't mean that we have to do without. LWRC has not just one but four: 12-, 16-, 18- and 20-inch barrel versions. I had an opportunity to put the 20-inch version through its paces, and I have to tell you, I really liked it. exterior features are all instantly recognizable and familiar to the 5.56 shooter. Well, most of them are. Where the 5.56 has a charging handle on the rear of the upper receiver, the REPR has a charging handle on the left side. It is non-reciprocating, so it won't move when you shoot. It has a large knob, and if you press in on the knob (toward the rifle interior), it engages the charging handle, and you can then use it as a forward assist. When you let go, the spring-loaded knob pops back out, ending its short tenure as an assistant. notice the one on the right — which is a shame, as you can use your trigger finger to drop the bolt. Especially when shooting from the bench, I found it a lot easier just to angle my trigger finger up and press the tab than to press with the left hand and then have to resettle the rifle in the bags. Inside, the 20-inch version has an adjustable Geissele trigger. The other models have either a non-adjustable Geissele or tuned mil-spec triggers. Geissele has not only designed a fabulous trigger, but it has figured a way for our military to have a match, select-fire trigger. This one, alas, comes semi only. Still, the Geissele trigger is clean, crisp and a joy to use. On the back end is a Magpul PRS, the company's sniper stock with adjustments for length of pull, comb height and a special rail on the bottom to attach a monopod. The handguard is the LWRC ARM-R fore-end, a low-profile free-float tube with regularly spaced drilled and tapped holes on the bottom and sides. If you want a bit or more of rail in some section, you simply bolt on the length rail you need, at the location you need (rails and screws provided). If you're handy with tools, you can even measure and cut a longer rail to a shorter length, for just the gear you want on and no more. The smaller-diameter tube that results from not having permanent rails makes the rifle very handy. Had LWRC not made the fore-end this way, the result might well have been something so bulky you'd need NBA-sized hands to grab it. Inside the fore-end is a 20-inch heavy contour, cold rotary forged, Nicorr treated barrel, chambered in 7.62 NATO. The twist is 1:10, and on the end is a .308-size A2 flash hider. Backing it all up is an LWRC-upgraded bolt, and what drives it is the LWRC short-stroke piston system — proportioned for, and beefed up to withstand, .308 power. The LWRC piston system has a four-position gas adjustment bolt. You can set the gas for normal, more (adverse conditions), less (using a suppressor) or none (no-cycle suppressor work) at your discretion. The LWRC REPR comes with a Magpul 7.62 magazine, which is one of the competing "AR-10" magazine designs. Derived from, and compatible with, the original AR-10 and the M110 rifle currently used in some branches of the armed forces, the Magpul holds 20 rounds of big-bore goodness. The top rail of the receiver and fore-end are co-planar and continuous to the end of the fore-end. You can mount lots of gear there, perhaps more than you really should. The REPR comes with folding sights, front and rear, marked with LWRC and the company's logo. A brief aside, to those looking at the spec chart, who will no doubt snort something to the effect that an M14 weighs two pounds less. Yes it does. And it has no provision for mounting lights, lasers or scopes in a rational manner. And, it is longer, less accurate and hardly user-customizable at all. I had a pretty decent selection of .308 ammo to run through the REPR, and I managed to get some impressive accuracy results for my efforts. As with any rifle, I'm sure this one will show preferences for one load over another, but that will take someone with a little more trigger time on precision rifles than I have. As it was, the rifle shoots well enough to make me look like a brilliant rifleman, and that makes it very attractive. Smallest group: Hornady TAP FPD 168 gr. — 1.0 in. Largest group: Hornady TAP FPD 110 gr. — 2.5 in. 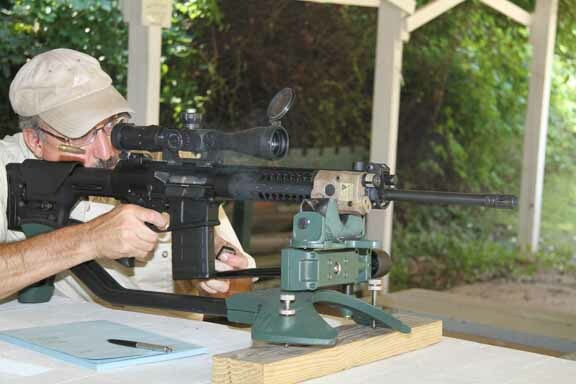 Accuracy results are the averages of four five-shot groups fired at 100 yards from a mechanical rest.